I’m very fond of using fruiting ornamental plants in the landscape. Often, they pack a one-two punch of interest: colorful autumn leaves and gorgeous fruits. Sumacs, hollies, cotoneasters, crabapples, and viburnums are eye-candy for us and a food source for wildlife. One of my favorite fruiting plants is the beautyberry. I’m particularly fond of our native species, American beautyberry (Callicarpa americana). During the growing season this plant looks like any other green leafy shrub with long, slender branches. From June through August it produces attractive lavender-pink flowers along its stems. 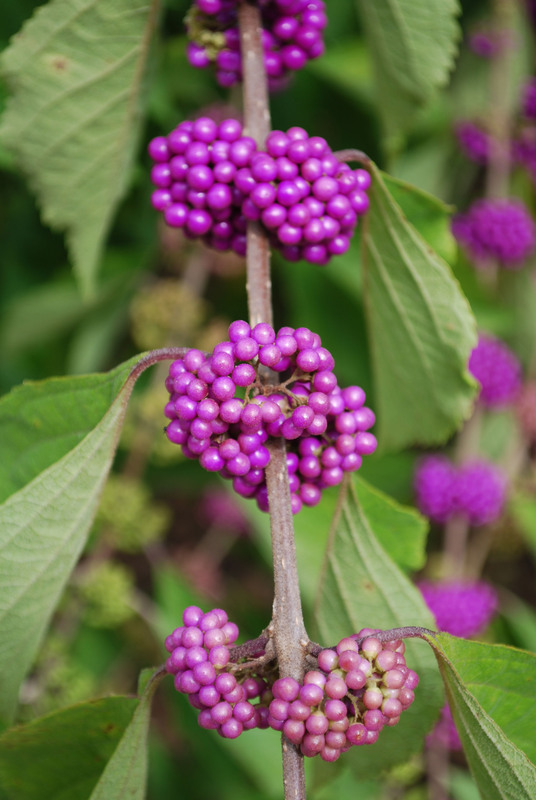 It’s not until late summer and fall when American beautyberry gets noticed. Clusters of golfball-sized iridescent purple berries occur along the length of each branch. Often the shiny purple berries will persist until December, long after it sheds it yellow leaves. My daughter used to call these shrubs “Barney Berries,” in honor of that famous purple dinosaur on PBS. The fruit clusters are big, boldly colored, and beautiful. Serious gardeners may ask: “What can you grow alongside your beautyberries that will complement their purple fruits?” Since beautyberries can be grown in full sun to part shade, plant them at the edge of woodlands or in beds with ornamental grasses to serve as a foil to that earthy color scheme. Others have successfully combined its purple berries with asters and goldenrods. If purple is not your color, then consider the white-fruited ‘Lactea’ or ‘Russell Montgomery’ American beautyberries. Their pearly-white berries will go with anything. But if you want to make folks look twice and ask: “What’s that?”, then you have to go with purple. Beautyberries are rather easy to grow. In the spring cut them back close to the ground. Since flowers and fruits are produced on current season’s growth, drastically cutting them back will give you a terrific display on a multitude of gracefully arching branches. During very dry summers I water it occasionally. If you’re also interested in growing edible fruits, such as blueberries, blackberries, and raspberries–the ones with antioxidants, fiber, and vitamins—then feel free to shoehorn them among your beautyberries. After all, anything goes with purple. ← When is the best time to prune spireas?